A blood pressure gauge is an important instrument for measuring blood pressure. In recent years doctors have increasingly recommended home blood pressure monitoring as an effective way of managing hypertension. A gauge for blood pressure is also known as the sphygmomanometer. 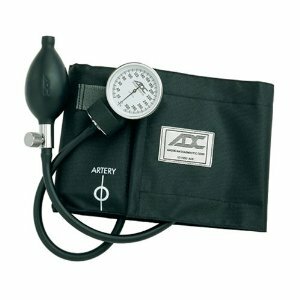 Two types of sphygmomanometer exist namely the one using mercury with a mercury column and a dial face gauge. The one with a dial face gauge is the most frequently used at home today after automatic digital blood pressure monitors that have an automatic blood pressure cuff. This is also known as the aneroid sphygmomanometer with a manual rubber inflation bulb. 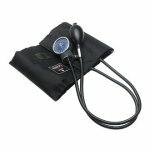 The following are reviews of specific blood pressure gauge instruments currently available on the market. It can be noted that some people interchangeably refer to digital blood pressure monitors as gauges for blood pressure. 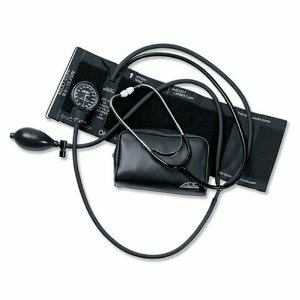 However strictly speaking a gauge refers to the sphygmomanometer type blood pressure monitor which comes with a stethoscope. At the end of this review article we give recommendation of specific automatic digital blood pressure monitors apart from the gauge types reviewed here first. 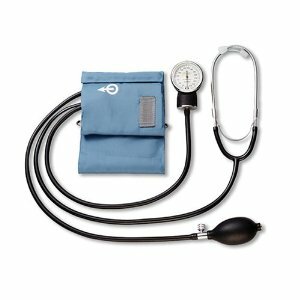 this gauge for blood pressure measures both diastolic and systolic blood pressure numbers by manual inflation of the blood pressure cuff using the supplied upper arm cuff. The gauge can measure up to 300mmHg of pressure a figure no human being can reach under normal circumstances. This gives a very good clearance from the highest possible measurement in human beings. This gauge is durable and reliable and offers a lifetime calibration warranty. Calibration is a very important consideration in as far as blood pressure monitoring is concerned. this blood pressure gauge is manufactured by American Diagnostic Corporation. It is assembles in the United States and is well known for its 20 year calibration warranty. The gauge is pocket size and has the ADCUFF nylon cuff which is designed to prevent miscuffing. Miscuffing is a worrisome cause of inaccurate readings when it comes to blood pressure monitoring. This particular item for those purchasing through Amazon is currently only being shipped within the United States. Also manufactured by American Diagnostic Corporation (ADC) this Advantage model gauge will set you back some $25.00 on Amazon. It is a fully manual blood pressure monitor which comes with a D-Bar cuff, has a semi-automatic air release valve, comes with a stethoscope and the squeeze bulb is made of latex free rubber a plus for individuals allergic to latex. When buying from Amazon which is arguably the most reasonable source on line price wise, select countries outside of the US can order the product. This ADC Advantage model pressure gauge has some excellent customer reviews.